Notre jolie maison à flanc de colline a les plus belles vues de montagne de chaque fenêtre, nous sommes à seulement 2 km du lac de Bled, et nous sommes sur la route de la célèbre Vintgar spectaculaire qui est juste une courte distance de marche, le village de Zasip a tout ce dont vous avez besoin; un supermarché bien approvisionné, un sympathique pub / restaurant avec une excellente cuisine locale, et une pizzeria juste 5 minutes à pied de la colline de notre maison. Tout est à 5 minutes à pied dans. Nous avons un joli jardin avec ruisseau et étang, et une grande terrasse ouverte, ainsi que deux terrasses privées plus clos avec de belles vues pacifiques. Une salle de bain avec baignoire et douche séparée, WC, et grand bassin. La deuxième chambre a une toilette et lavabo en suite. articles de toilette sont fournis. Notes sur l'hébergement: Le Wifi est disponible gratuitement dans notre restaurant local, un pub, et par l'intermédiaire de nos voisins. aussi sur notre terrasse et pièces de la maison Dehors: Nous avons un jardin en terrasse avec un flux naturel et étang qui a une terrasse fermée, qui est drapée dans la vigne, et dispose d'une table de salle à manger, des chaises ainsi que deux chaises longues en bois confortables pour se détendre. Également un barbecue électrique. Il ya aussi une grande terrasse sur le toit qui est clos et et a une table et 6 chaises et un hamac. Nous avons deux vélos de travail pour votre usage. Buanderie: Il ya une machine à laver, fer et planche à repasser dans le sous-sol ainsi que des installations de séchage. Service de nettoyage / serviettes / / Femme de ménage: Les serviettes et les draps sont inclus et la propriété est nettoyée après chaque séjour, Autres: Nous avons une petite cave à vin, et deux salles de sous-sol pour le stockage, les clubs de golf, de pêche, ski, luge, etc. A really lovely, clean and very well equipped house, even more spacious than we were expecting. Gorgeous views from the balconies. 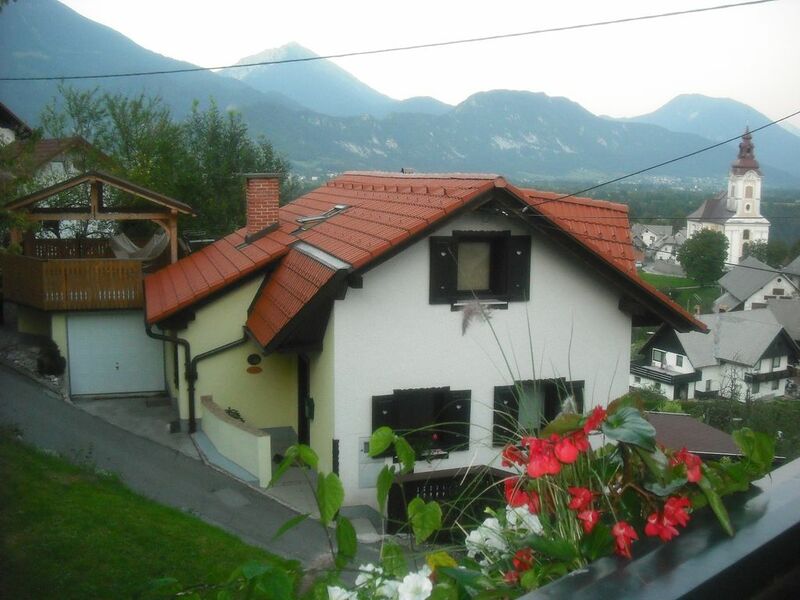 Situated in a lovely village really close to Vintgar gorge and Lake Bled, with a nice and reasonable restaurant. Elaine was really helpful. We didn't want to leave and loved our time here. Supermooi uitzicht, attente eigenaresse, een echte aanrader! Prachtige locatie, fenomenaal uitzicht op de bergen en op Bled. Op loopafstand zit een heerlijk restaurantje en in het dorp een supermarkt. Het huis is ruim genoeg, met alle apparatuur die je nodig hebt (op een wasdroger na). Verder een superlieve eigenaresse, heel betrokken en attent. Wij hebben een geweldige tijd gehad in Slovenië: de bergen, de cultuur, de mensen. En oud∋euw met uitzicht op het vuurwerk in de omgeving was geweldig. We willen graag terugkomen! I am delighted Suzanne her husband and there twins had a wonderful time over Christmas and New year at our house , enjoying the fireworks and local culture , it was a pleasure to have them stay . And I hope one day they will return . schönes gepfegtes Ferienhaus 3 km von Bled entfernt. Ich habe als Einzelperson dort schöne zwei Urlaubswochen verbracht. Im Haus mangelt es an nichts. Allenfalls vermisst man einen Fernseher mit deutschsprachigen Programm. Es gibt mehrer Balkone mit Sitzpätzen im Freien je nach Stand der Sonne. Außerdem gibt es einen herrlichen Blick auf Bled und Umgebung. Bled ist ein guter Ausgangspunkt für Wandertouren in den Julischen Alpen oder in den Karawanken. it was a pleasure to have Guido stay at our house on his own for 15 nights , and are delighted he enjoyed the beautiful views from our house and the wonderful walks within easy reach , we look forward to your return Guido . Vom Haus aus kann man schöne Wanderungen und Radtouren unternehmen, zu Ausflügen nach Bled (See) zum tollen See von Bohinj, zur Seilbahn (Vogel), nach Kranj und Ljubljana starten. Vor Ort in Zasip findet man einen kleinen Supermarkt und ein gutes und günstiges Restaurant, so dass man einen abwechslungsreichen und erholsamen Urlaub erleben kann. Die Slowenen sind sehr angenehme Menschen, mit englischen Sprachkenntnissen kann man sehr gut kommunizieren, oft wechseln Gespräche aber schnell ins Deutsche. Spaß macht es, mit dem im Haus befindlichen englisch-slowenischen Wörterbuch slowenische Vokabeln zu ergründen. Wurst, Fleisch, Wein, Obst und Gemüse sind schmackhaft und günstig. I am so pleased Sibylle Paul and friends enjoyed staying at our house in Zasip , and found places easy to get to from here . My husband and I thoroughly enjoyed our two week stay here. The house is in a lovely peaceful village with great views; it is just as per the photos - but much bigger than I expected, with plenty of room and lots of outdoor space. It is equipped with all you could possibly need for a comfortable stay. We particularly liked sitting on the balcony outside the lounge enjoying the view along with a glass or two of wine each evening. We briefly switched on the TV the first night at the house but after that didn't bother as we preferred the views! However, there are lots of DVDs provided for anyone who'd like to watch something, plus a CD player, a variety of books, and plenty of pamphlets re places to visit, as well as road maps (very useful to take in the car in case the SatNav loses signal). As per a previous review, the road to the house is very narrow and steep - I'd hired a VW Polo which was just the right size to navigate this. Whilst on holiday I like to research online re places to visit so would reiterate that, as noted in the house description, the internet reception is patchy - it is also slower than you may be used to at home. However, the restaurant in the village has free wifi. From the house there are lovely walks around Zasip as well as longer walks to Vintgar Gorge and Podhom, as well as Bled itself. The Gostilna Kurej is just a few minutes' walk from the house and does delicious food, with plenty of options - even for someone like me, who only eats fish / veggie meals (their trout just melted in the mouth and they did a lovely mushroom risotto). There's also a small Mercator in Zasip for general groceries, whilst there's a larger one in Bled. Elaine was very easy to communicate with throughout. We took the train from Lesce-Bled station into Ljubljana one day, to save driving into the city. Other places we visited were: Vintgar Gorge; Škocjan Caves (well worth the long drive); Lake Bohinj and the cable car up to Vogel (great views); Velika Planina; Kropa; Škofja Loka; Kranjska Gora; the Franja Partisan Hospital (a fascinating place to visit, hard to find but worth the effort! ); Vrsic Pass, Kobarid and of course Lake Bled itself. We loved Slovenia and its warm and welcoming people, and this house was a great base for us - we're already missing the peace, the sound of the church bells, and the wonderful views! "Hvala" Elaine for letting us stay in your lovely home. It was a pleasure to have them stay , Thankyou for choosing our holiday home . It was perfectly located in a small, quiet village. Just what we like. The views were the best!!! We have stayed in many rentals in Europe and we consider this one of the top ones. Views, very clean, easy parking, accommodating owner, well-stocked kitchen, lovely neighbors. We fell in love with Slovenia. Such a kind people. The rental is located close to so many beautiful things to see. And it's quiet.....maybe a few tractors going by, maybe some goat bells, maybe church bells......what's not to love about all of this. Grocery store handy, the local restaurant has terrific food. Hearing Slovenian families enjoying each other over food and laughter. Just so special. There are not many places we say "hey, let's come back here" but our 8 days here were incredible. We'd love to come back. Elaine is very responsive on e-mail, is so kind hearted......it was a pleasure staying in her lovely home. Til next time, Elaine!!! I am so pleased our guests enjoyed staying at our holiday home in Zasip and it was everything they wished for , We would love them to return sometime perhaps for longer next time , it was a pleasure having them . Les plages du lac de Bled est un cycle de cinq minutes en voiture ou dix minute. Nous sommes à 30 minutes de l'aéroport de Ljubljana. GoOpti est un transport à faible coût qui ne transferts chers de Venise, Trieste etc aéroports à partir de 10 euros. Une voiture est recommandée, mais pas indispensable. Nous sommes dans le centre du village à 5 mn de la boutique et restaurant et pizzeria. la promenade sur la route en Bled prend environ 30 minutes, par nos motos 10 mins. Ljubljana est à 40 minutes en voiture 30 minutes à Bohinj et Kranjska Gora. La maison est à seulement 10 minutes à pied du début de la célèbre Gorge Vingkar belle, et le rafting en eau peut être fait seulement une courte loin.